(June 1988, Calcutta) – The Contai Basin is the area between the Rasulpor and Suvarnareka Rivers where they are about to merge in the Bay of Bengal. The Bengali name of Contai is Kán’thi derived from the Sanskrit word kan’thiká. 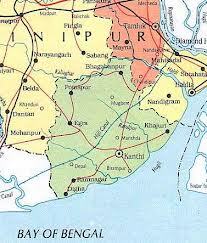 The British changed Kán’thi to Contai because to them Kánthi sounded similar to Kandi in Murshidabad district and Kanthi in Midnapore district. In the Contai Basin there are numerous natural resources which can be the basis for various large-scale, medium-scale and small-scale industries in the planned development of the area. Nature has generously allocated her resources to almost all the regions of the world – on land, in water, in space, in the deserts, in the mountains, in the dense forests and on the bottom of the sea. Nowhere has nature been miserly in bestowing her wealth. By applying human intellect, wisdom, enterprise, mutual cooperation and commercial acumen, these natural resources can be fully utilized, and each region of the world can be developed agriculturally, industrially and commercially into viable self-sufficient socio-economic units. Planning for the economic development of the Contai Basin should be included within the framework of block-level planning. If this approach is adopted it will ensure integrated, balanced and multi-purpose developmental planning. Unfortunately, no government has so far taken a constructive approach to the socio-economic problems of the region or bothered to assess the actual amount of natural resources and economic potentialities in the Contai Basin. Economic planning must identify the particular problems of the Contai Basin and utilize the natural resources of the region to solve them. Of all the problems affecting the area, the worst is the frequent occurrence of cyclones. The Contai Basin is a low lying area along the coastal belt of South Bengal. About 200 to 300 miles out to sea depressions often form in the Bay of Bengal. As a result the human beings, animals, buildings, agriculture and natural environment of this area are regularly subjected to violent cyclones which cause untold loss of life and property. To control the fury of nature, there must be extensive afforestation in a strip one mile wide along the entire coast. In this strip trees such as shishu [Dalbergia sissoo Roxb. ], cashew nut, jackfruit and hoop pine should be grown. These varieties of trees will create an artificial forest which will function as a natural wall to keep the powerful cyclonic winds and the destructive force of nature from wreaking havoc in the region. A new kind of afforestation programme must be developed for this purpose. Such a programme will yield a number of benefits – the cyclones will be resisted; the loss of agricultural land will be minimized; new forest resources will flourish; regular rainfall will increase; the production of cash crops such as cashew nut and jackfruit will develop; and the purchasing power of the people will be enhanced. If a village or settlement already exists within the coastal strip, it should not be destroyed. Rather, the afforestation should be done all around it and continued along the coast. If the pine trees are planted close together, the pores of the leaves will attract the rain clouds, and as a result there will be a profound beneficial change in the climate of the region. The afforested strip will also greatly assist the prevention of soil erosion along the coast. In rural Bengal large-scale soil erosion is called khoyái. The pine trees spread an extensive network of roots under the earth, compacting the soil particles and binding them tightly together. Besides afforestation there should also be large-scale cultivation along the coastal sand dunes of all varieties of melon, such as musk melon, deer melon and watermelon; and gourd, such as squat gourd. These creepers will spread out across the surface of the dunes, hence soil erosion will be prevented. (Melons grow best during the summer, the worst season for cyclones.) If sand dunes are kept uncovered, the winds from the ocean will blow the sand away and erode the coast line, reducing the area of land and encouraging the encroachment of the sea. In the Contai Basin there is enormous potential for large-scale marine industries. For example, the cultured pearl, salt, iodine, phosphorus, oyster, conch shell and seaweed industries can all be developed. Cultured pearls can be grown along the Contai Basin coast and sold in both the national and international markets, earning a lot of revenue. Other pearl based industries can also be established. This kind of enterprise will strengthen the rural economy of an undeveloped area. The cultured pearl industry brought prosperity to the fishermen along the coast of Japan. The Contai Basin has enormous potential for developing cultured pearls. Within the one mile wide afforested coastal strip, salt manufacturing units may be established at various places. Salt tanks may also be constructed at different points along the coast. This industry will create direct and indirect employment for hundreds of families, and the chronic unemployment problem of the Contai Basin will be alleviated to some extent. If the salt industry is developed, West Bengal will not have to depend upon Gujarat, Maharashtra or South India for its supply of salt. This will also help check the outflow of capital from West Bengal, so the state will experience overall growth. In the Bay of Bengal along the coastal area of the Contai Basin there are many types of seaweed, which can supply iodine, phosphorus, potassium, sodium, sodium chloride and other valuable chemicals. On the basis of these chemicals, a number of chemical industries can be established in the region. Due to the abundance of iodine, pharmaceutical industries can also be developed. Along the Contai seashore various types of beautiful oysters and conch shells are available, which can be utilized to make ornaments, house decorations, handicrafts and a variety of other products. In the sea along the Contai Basin many types of seaweed and aquatic plants grow which can be used to produce various medicines and protein rich foods. Seaweed processing factories can be built at various places along the coast. Most seaweeds belong to the grass family of plants, and vegetarians can eat the protein from seaweeds of this group. However, if the protein collected from a particular variety of seaweed causes an allergy in a person, then the protein of that variety of seaweed should be considered static for that person. Pharmaceutical industries can be established to produce protein foods and protein tablets which can be used as both food and medicine. Cash crops such as coconut, squat gourd, melons of all varieties, cashew nut, jackfruit, chiku, betel nut, betel leaf and banana can be grown in abundance. The soil of the southern and southeast portion of Midnapore district is saline, which is why coconut grows very well there. Large quantities of coconuts can be grown in the adjoining area of Contai for the same reason. The hybrid variety of coconut from Kerala produces fruits within only five years and can grow abundantly in the Contai Basin. The leaves can be used as fuel and the small branches as broom sticks. The kernels can be pressed to produce oil, thus the coconut oil industry can be profitably developed. Coconut oil can be used as both a hair oil and as an edible oil. A network of small-scale or cooperative coconut industries can be established in the Contai Basin to supply coconut oil throughout West Bengal and the northeastern states of India. Even the shell of the coconut can be used to produce various commodities. Thus, in every village there is the potentiality to develop cottage industries. Coconut milk can be bottled and sold in distant places as a cold drink, coconut pulp can be used in the sweet industry, and the trunk of the coconut tree can be used in the house building industry. Coconut husks are used in the mat and window screen industries, dehydrated coconuts are used in ayurvedic medicines, while in Bengal there is a large market for coconut delicacies. These industries can also create a lot of income for the local people. In fact if coconuts are grown on a large scale in the Contai Basin, the local economy will be transformed automatically, and the standard of living of the people will be greatly increased. The beach in the Contai-Junput-Digha region is very wide, so it is easy to grow squat gourd and melons profitably beside the seashore. Where the land does not become submerged by sea water, poor farmers can improve their economic condition by cultivating squat gourd throughout the year. Melons can also grow in abundance. In hot countries like India, melons are in great demand. Melons and squat gourd are some of the popular cash crops of the area. Cashew nuts are also a very profitable cash crop in India and abroad. The soil and weather of the Contai Basin is quite congenial for cashew nuts. Through the application of modern agricultural science, the quality of the cashew nut harvest can be greatly increased. Cashew nuts can be fried and packed or eaten raw, while cashew nut powder can be used to make sweets. The local farmers can earn a good livelihood by utilizing this valuable cash crop in various ways. Jackfruit is also a very lucrative cash crop. Jackfruit is very nutritious, so villagers can eat the raw fruit to improve their health, and the juice can be canned or bottled and sold in the market at profitable rates. Dried jackfruit seeds can be used as an alternative to potatoes. Potatoes have been in use in Bengal and India for the last few hundred years, but prior to that the people of Bengal used jackfruit seeds as vegetables. The food value of jackfruit juice and seeds is very high. The soil and weather of the Contai Basin is very congenial for chiku. Chikus will grow abundantly along the coast as far as the salty sea air travels inland, but beyond that distance the fruits will not grow so well. Chiku is a nutritious, tasty and popular cash crop. Besides these crops, abundant betel or areca nut, betel leaf and bananas can be grown in the Contai Basin. All these are profitable cash crops. Digha is the widest sea beach in the world. At some points the beach is two miles wide. Together with the creation of a forest along the Digha sea coast, a well-made road and a railway line should be constructed parallel to the seashore. If this is done, Digha will develop into an ideal resort for tourists from Bengal and other states of India. People from other countries will also visit Digha to enjoy the natural sea beach. If good hotels, healthy drinking water, the Danton-Digha railway line and cultural centres are arranged, Digha can become an extremely popular and attractive sea resort. This development will virtually eradicate the poverty of the people. Many new food stalls, vegetable markets and transport facilities will provide job opportunities for the local people. A small distance from Digha an ideal port can be built at Bhograi at the confluence of the Suvarnareka River and the Bay of Bengal. The future of the Haldia Port is not very bright, so if a new port is established in the mouth of the Suvarnareka River, another large commercial centre can be added to the map of Bengal. All the commodities which are imported and exported through the Calcutta and Haldia Ports can also pass through this port, as well as all the agricultural produce, coconut, betel leaf, areca nut, melon, squat gourd, banana, etc., that can be grown in the Contai Basin. Once the port is developed, various new export industries can also be established in the Contai Basin area. The people of Contai will no longer rush to Calcutta, Durgapur, Tatanagar or Bombay in search of employment. In fact, if this port is constructed, the entire Contai Basin as well as the southern portion of Midnapore district will undergo an economic revolution. The Howrah-Danton-Digha railway should also be constructed immediately. In the Contai subdivision there is no railway line. For the speedy development of this area, there must be a railway line between Danton and Digha, then passengers from Calcutta can travel directly to Digha. Once this railway line is established, the progress of the Contai Basin will be accelerated, facilitating the development of industry, trade and commerce throughout the subdivision. The Danton-Digha railway will be the lifeline of the Contai subdivision. In fact, if the railway line is extended to Bhograi along the coast, then the trade, commerce and industry of the entire region will rapidly develop. For railway tourists, this area will become an attractive tourist resort. It is unfortunate that in the Contai Basin, which has abundant natural resources and enormous economic potential, no industries other than mat-making and weaving exist. During the last forty years, both the Congress and Left Front governments have proved to be totally negligent and incompetent, and both have failed to develop the economic potential of the Contai Basin. Today even the traditional mat-making and weaving industries are on the verge of collapse due to lack of capital. The mat-makers should be encouraged to produce mat sticks on a cooperative basis through the provision of low interest loans, and proper marketing arrangements should be made so that they can sell their finished products throughout India. Their mats can also be sold to other countries which have warm climates. If this is done the poor mat-makers will earn a decent living. Ninety percent of Bengal’s mats are now produced in Midnapore district. Likewise, the weavers of the Contai Basin should be trained to use power looms instead of outdated handlooms; then they will be able to compete with modern, large-scale weaving enterprises. The government should have encouraged the formation of weavers cooperatives, but nothing has been done so far in this regard. Handlooms should only be used to make special items such as clothing adorned with high quality embroidery, but for all other items, the weaving industry will have to conform to modern standards and preferences. If the mat-makers and weavers are properly organized and these industries are modernized and developed, thousands of families will benefit economically. One of the sources of income for the fishermen of the Contai Basin is dried fish, which is exported to different markets in India and Bangladesh. The fish are usually dried in the open, so the bodies rot, creating a foul smell. This pollutes the atmosphere, and as a consequence negative microvita attack the coastal area. From the viewpoint of public health and welfare, this type of fish production cannot be supported. With the help of modern technology, dehydration plants should be built to dry the fish scientifically so that no foul smell is created in the atmosphere. Both cooperative bodies and the government will have to come forward to establish such factories. According to the principles of psycho-economy, static food production should not be encouraged, but considering the traditional habits and psychology of the people, the system of producing dried fish should not be stopped immediately unless alternative sources of livelihood are arranged for the fishermen. But because of the importance of public health, and the air pollution, the production of dried fish which has a foul smell should be stopped as soon as possible. The availability of the minimum essentials of life plays a vital part not only in achieving a world family but also in the development of the personality. This problem should be tackled on a world-wide basis. Every human being must be guaranteed certain minimum requirements. The availability of food, clothing, medical assistance, education and housing should be arranged, so that human beings may be able to utilise their surplus energy in subtler pursuits – energy which until now has been engaged in procuring the essentials of life.